True Endeavors’ Question Of The Week: Back To School Edition | True Endeavors Presents: music, tours, tickets, mp3 downloads, concert pictures, videos, Madison WI. Have your responses posted by 6pm on Sunday, August 25. A winner will be chosen and notified shortly thereafter. Good luck! Alice Cooper – School’s Out. It is for me. Had my credits in June. The ABA has a 24 month rule which made me wait for my diploma. Soon my wisc email will stop working and I will stop receiving your junk mail. You do know there’s a lot easier way to not receive “junk mail” that you subscribed to…unsubscribe if it’s that bothersome to you. From Chuck Berry’s School Days to Nirvana’s School this has been a fond subject for rock and roll. I’m partial to the Kink’s Schoolboys in Disgrace abum with their anthemic, “Education”, which of course predates Pink Floyd’s, “we don’t need no education.” Don’t forget Van Halen’s Hot for Teacher! 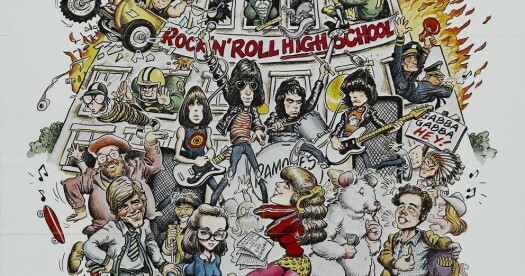 “Rock n’ Roll High School” by the Ramones. Books by Belle And Sebastian. After a long-lasting debate, my pick goes to “School” by Nirvana, from the album Bleach. The song is one classic scholastic-themed song plus school-based lyrics. Simplistic lyrics, yet powerful messages. NO RECESS!!! How has no one said “Another Brick in the Wall, Part 2” by Pink Floyd? A classic that while a great tune, also sends a strong message of protest against certain rigid education systems and was used during demonstrations and even banned in South Africa! The school choir used in the chorus definitely adds to the powerfulness of the message. And how can anyone forget the music video?! HEY! Teacher! Leave those kids alone! An optimistic and determined romantic start year. Returning for another semester is a hopeful act. A bet that we can make more of ourselves and society. A bet on adventure. Congratulations, DJ! You’re the winner this week. Check your e-mail.